In many places around the world, gender equality is deeply misunderstood. What's worse, it's often stereotyped as a foreign movement that will destroy cultural norms and disrupt community harmony. In these situations, how can paralyzing gender stereotypes be broken? The simple answer is often courage. It takes a helping hand from the outside and courage from the inside. 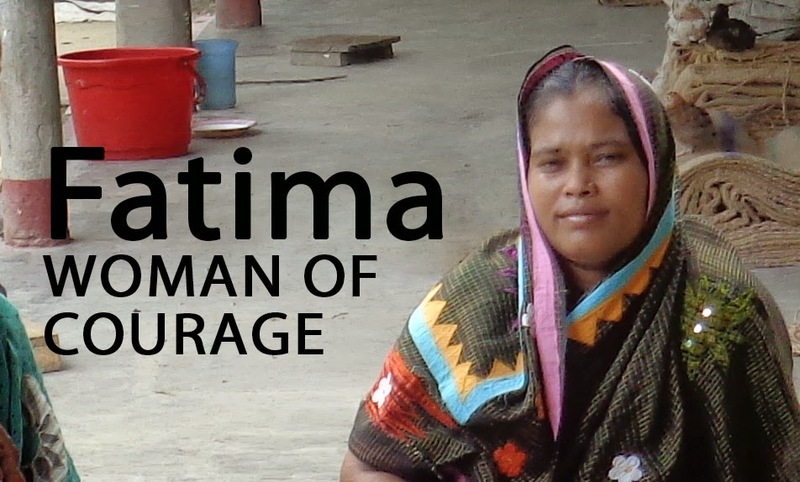 Meet Fatima, a woman of courage. A typical wife and mother in the small village of Sabjipara, Bangladesh, Fatima and her family were trapped in the systemic poverty of their village. Located just outside Mymensingh, Sabjipara is a small, densely populated village. Most residents live in cramped houses, are economically depressed, and have little to no literacy. The majority of men make their living as day labourers while their wives and daughters are generally forbidden from working outside the home, earning money, or managing household affairs. As a woman, then, Fatima was not allowed to seek employment, nor did she have the skills to earn a decent wage; at the same time, her hard-working husband’s meagre earnings could not keep the family afloat. Due to this financial hardship, Fatima's children's education was in danger. In 2007, however, Fatima’s daughter, Farjana, was registered as a sponsored child with Food for the Hungry. The sponsorship program provides for a child’s education, basic medical care, and offers income-generating skills training for her parents. Fear of empowering women, however, made it difficult for Fatima to become meaningfully involved with FH initiatives, and her family continued in poverty. But then she decided to join an FH supported Learning and Savings Group, specifically the Meghna Mahila Unnayan Dol ("Women’s Development Group") (WDG). After joining the WDG, Fatima received basic literacy, health, values, and leadership training. It wasn’t long before her potential was recognized and she was made the leader of the group. In spite of cultural norms, Fatima urged her Group to engage in income generating activities so that they could contribute to their families' finances. Change, however, does not happen overnight. Fatima’s group fought an uphill battle for many years. Initially, the group functioned more like a women’s club than a catalyst for development; they gathered to observe religious festivals, but tackling cooperative initiatives for the betterment of the community was rare. Undeterred, Fatima continued to encourage her group members to break gender stereotypes. Fatima and her group faced challenges arising out of religious prejudice; men in the community did not want their women leaving home to attend Group meetings or engage in Group activities. You can imagine how difficult it was for Fatima to get the Group organized! Local FH staff also faced tremendous challenges as they worked with the men to overcome their fears and misconceptions of gender equality. Simultaneously, they encouraged the women to pursue their rights, even in this hostile environment. Under Fatima’s leadership and with FH's support, the women of Sabjipara persevered. To help deconstruct gender stereotypes, FH arranged leadership training and provided education on health, law, and values, followed by income generating activity training such as sewing, handicraft making, and cow rearing. The children of Savings Group members also received education support from FH through the child sponsorship program. As a result, 15 year old girls like Farjana, Fatima’s daughter, are staying in school instead of getting married at a young age. The community's Savings Groups members (including men) now understand that women's economic activities are indispensable to the success of their society. Fatima now earns money as a seamstress. She continues to lead lead her Women's Development Group, empowering other women to improve their situations. It takes courage, patience, and a commitment to long-term relationship to see change in any community trapped in poverty and struggling to overcome entrenched cultural norms. Fatima had the courage, patience, and commitment to partner with FH as they walked with Sabjipara on their path to economic sustainability. She dared to break the gender stereotypes in her village in order to bring her family and her community to a place of thriving. If you would like to empower other women like Fatima to break gender stereotypes, consider providing an Accounting Kit for a Savings Group, giving a woman a sewing machine, or sending a girl to school via the FH Gift Guide.